The most important thing when buying a classic engagement ring is finding a trustworthy jeweler. For over 30 years Hannoush Jewelers, of The Capital District in New York, have developed the bond of trust with their customers through their thoroughness of customer care. They agree, “There is a bond created when an individual buys a piece of jewelry and that bond is based on trust”. For all your jewelry needs, for every special occasion, Hannoush Jewelers provides the finest selection and services to you. We are pleased to call Hannoush Jewelers, New York our Coast Diamond retailer of the Week. This beautiful Coast Diamond one carat solitaire engagement ring (LC10186) features a diamond encrusted band with scalloped sides. Year after year, the one carat round diamond center stone is the most sought after diamond for an engagement ring. This stunning Coast Diamond three stone engagement ring (LC5375) is finished with fine pavé-set diamonds on the band and milgrain edging. The trend of stacking diamond rings takes on the classic look when each ring is finished with milgrain edging. See the look in our featured image above. The epitome of classic is the Coast Diamond band (WC20017) intricately set with round brilliant diamonds in microprongs. The generous 0.73-carat weight of this band makes it a great anniversary gift. There is an excitement to a classic Coast Diamond ring that you have to experience at Hannoush Jewelers. They have two locations in The Capital District of New York for you to shop their expanded bridal inventory and huge diamond selection. Congratulations to Hannoush Jewelers, of The Capital District in New York, for being our Coast Diamond Retailer of the Week! When choosing our Coast Diamond Retailer of the Week we get to browse and see what our Authorized Retailers’ customers love about Coast Diamond rings. It’s always fun to see who chooses bold or vintage, pavé or fishtail, round or oval. This week we find that the prettiest of Coast Diamond rings are the favorites of the Canadian brides of GMG Jewellers in Saskatoon, Saskatchewan. They love feminine details and unique bands, so it comes as no surprise that Canadian brides choose GMG Jewelers for their engagement ring shopping. GMG gives great attention to the details and they enjoy helping each customer celebrate what makes their love unique. This week we are pleased to once again call GMG Jewelers of Saskatoon, SK our Coast Diamond Retailer of the Week. Coast Diamond engagement rings set with the rose cut diamond center stone. Our pretty Coast Diamond engagement rings are delicate, intricate and feminine. They catch your eye with the pure glitter of diamonds. Which of these pretty Coast Diamond rings is your favorite? The gorgeously feminine Coast Diamond oval engagement ring (LC5410_OV) is crowned with a halo of round diamonds and accented by a band of diamonds. It is also available with a round, princess or pear-shaped diamond center stone. For the prettiest of finishes… Choose a rose cut diamond center stone. The delicately scalloped Coast Diamond solitaire engagement ring (LC6101) is perfect for a one-carat diamond center stone. The unique band of fishtail set diamonds makes this pretty engagement ring stand out from the rest. This intricately woven Coast Diamond band (WC10306H) has fishtail set diamonds braided halfway around your finger. It sits pretty next to your engagement ring or within a stack of diamond bands. Congratulations to GMG Jewellers of Saskatoon, SK for being our Coast Diamond Retailer of the Week! Buying an engagement ring is a wonderful adventure. For Evansville, IN couples, Droste’s Jewelry Shoppe is your trusted jeweler to help you choose where to go with your engagement ring style. Because things can go from traditional to trendsetting in the blink of an eye. Once you choose your engagement ring, Droste’s Jewelry Shoppe will teach you about diamond center stones, so you are sure to pick the perfect one for your lifestyle and budget. A longstanding and stellar reputation, along with classic to cutting-edge styles, Droste’s Jewelry Shoppe stands out as your engagement ring adventure guide and our Coast Diamond Retailer of the Week. Where to begin your engagement ring adventure once you get to Droste’s Jewelry Shoppe? 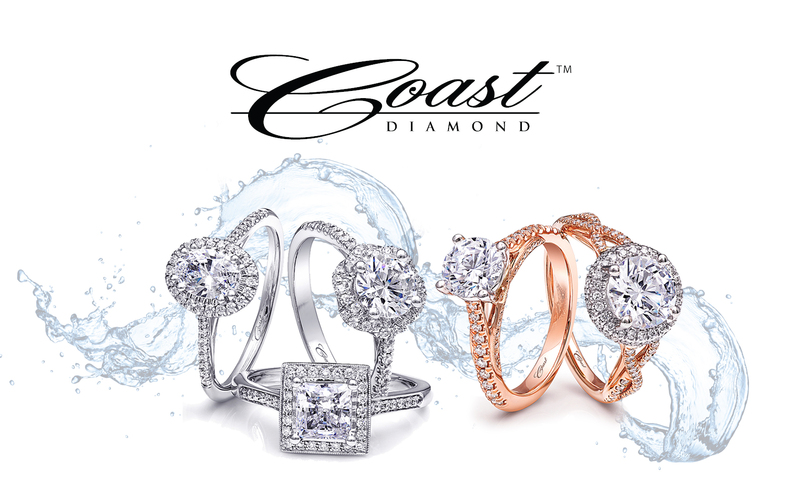 Our Coast Diamond Charisma Collection, of course. This traditional Coast Diamond solitaire engagement ring (LS10005), with fishtail set diamonds on the band, allows the center stone of your choice to be the spotlight. Leading the way in today’s bridal trends, this Coast Diamond 0.30 carat diamond band (WC5180H) is the perfect pair to your engagement ring. But as the trend demands, it takes more than one diamond band to make a stack, so stack it with (m)any of our Coast Diamond bands. The petite Coast Diamond halo engagement ring (LC5410) features a one carat round diamond center stone surrounded by a cushion-shaped diamond halo. As one of the most customizable engagement ring designs in the Charisma Collection, you can customize it to fit an oval, pear, or princess cut diamond center stone as well. See why our Coast Diamond Charisma Collection is so popular at Droste’s Jewelry Shoppe when you visit them at either of their convenient Evansville locations. upcoming trunk show Friday, June 16th and Saturday June 17th. View Coast Diamond rings, bands and more! This week’s featured retailer puts their passion into helping you find the perfect diamond center stone to create your one-of-kind engagement ring. They put an emphasis on cutting out the middleman, so you cannot only create the engagement ring of your dreams, but at a more affordable price. This week’s Coast Diamond Retailer of the Week is Diamonds Direct of Birmingham, Alabama. Your heart races. Your throat feels a little tight. You LOVE it! You see it in your favorite magazine and tear it out and save it for when the time comes? Well… The time has come! Diamonds Direct has the Coast Diamond engagement ring for you. Bring in those pictures and let them help you find the engagement ring of your dreams. The Coast Diamond petite halo engagement ring (LC5390) has diamonds on the cushion shaped halo and down the band. It suits a one carat diamond center stone you choose at Diamonds Direct Birmingham. The Coast Diamond Petite Halo engagement ring was chosen by The Knot to “Get the Look” of Maria Menounos’ engagement ring. The Coast Diamond twisting halo engagement ring (LC5449) has strings of diamonds that intertwine to create a stunning halo. It suits a 1.5 carat diamond center stone of your choice from Diamonds Direct Birmingham. This unique halo engagement ring looks beautiful set in any metal type, as shown here in Martha Stewart Weddings. This Coast Diamond band (LC2023) has alternating round and marquise shapes set with diamonds. It is finished with milgrain edging and is available (as all our Coast Diamond rings are) in white, yellow, or rose gold, or platinum. Choosing the metal for your Coast Diamond ring is very personal and there is no wrong choice, as seen in this Engagement 101 feature of Coast Diamond rings. Diamond Direct Birmingham has a wonderful selection of Coast Diamond engagement rings. Bring in your pictures and find the ring you’ve been dreaming of. Congratulations Diamonds Direct Birmingham for being our Coast Diamond Retailer of the Week!